Based on five years of proprietary research, How Remarkable Women Lead speaks to you as no other book has, with its hopeful outlook and unique ideas about success. It's the new "right stuff" of leadership, raising provocative issues such as whether feminine leadership traits (for women and men) are better suited for our fast-changing, hyper-competitive, and increasingly complex world. How Remarkable Women Lead is both profoundly moving and actionable. Woman or man, you'll find yourself in its pages and emerge with a practical plan for breaking through at both work and in life. SUSIE CRANSTON is an organization consultant at McKinsey & Company’s San Francisco office. As part of the McKinsey Centered Leadership Project, Susie led a team that completed the research for the Centered Leadership model. She received a B.A. and an M.B.A. from Stanford University. "We are always looking for new perspectives on growing great women leaders. 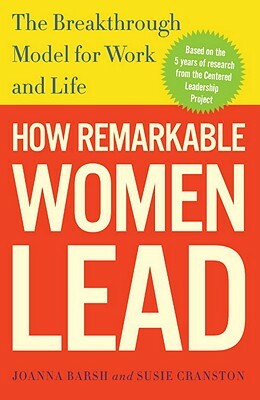 How Remarkable Women Lead is a great read, with real insights and actionable ideas! The inspiring stories give an intimate look at how remarkable women really get things done, providing a development model valuable to both women and men. This refreshing and action-oriented book stands out!" "What makes this book singular and valuable is its wide-lens focus on the personal qualities that lead to exemplary leadership. Don't be taken in by the title: men have as much to learn from this book as women." "Here are the stories of amazing women leaders in the context of an imaginative and pragmatic framework that rests on a rich fact base. It puts to rest stereotypes we have about who leaders are and how to lead. The seeds for our future are in here. The new CEO is a woman or a man who is not afraid to drop the John Wayne costume." "How Remarkable Women Lead is a book that will truly resonate with all women. It is personal, powerful, and revealing and thereby true to how we women live and lead. The storytelling makes this unlike any business book I know; these are people who have faced every challenge imaginable and still made their mark. So truthful, so revealing, it's a book at once inspirational and practical–a unique duality." —Elizabeth Smith, president, Avon Products, Inc.
"Over the years, I have worked with many remarkable women leaders. I know from personal experience that the talent is there, waiting to be tapped and developed. Investing in women leaders is not only the right thing to do, it makes clear business sense. Developing top talent for high performance is both an art and a science. Joanna Barsh and Susie Cranston provide the vision and the practical ideas to make this competitive opportunity a reality." —Terry Lundgren, chairman, president, and CEO, Macy's, Inc.
"Today's business environment demands fresh ideas–and this book delivers them. It is a great reading experience, with inspiration on every page. How Remarkable Women Lead has lessons for both men and women and tells them through powerful intimate stories. Is it possible to fall in love with a business book about leadership? Yes!" —Gerald Storch, chairman and CEO, Toys "R" Us, Inc.